The Church of St. Andrew of St. Paul, commonly known as St. Andrew’s Catholic Church or simply St. Andrew’s, is located in a residential area on Como Avenue, two blocks east of Lexington Avenue, and one block to the southwest of Lake Como. Designed by architect Charles A. Hausler, and constructed in 1927, the building represents an example of the Romanesque Revival style, which is a revival of the Romanesque style that first developed in Europe in the 9th through the 12th centuries. The church is not only significant in the Lake Como area; it is also among St. Paul’s most distinctive period revival style churches. 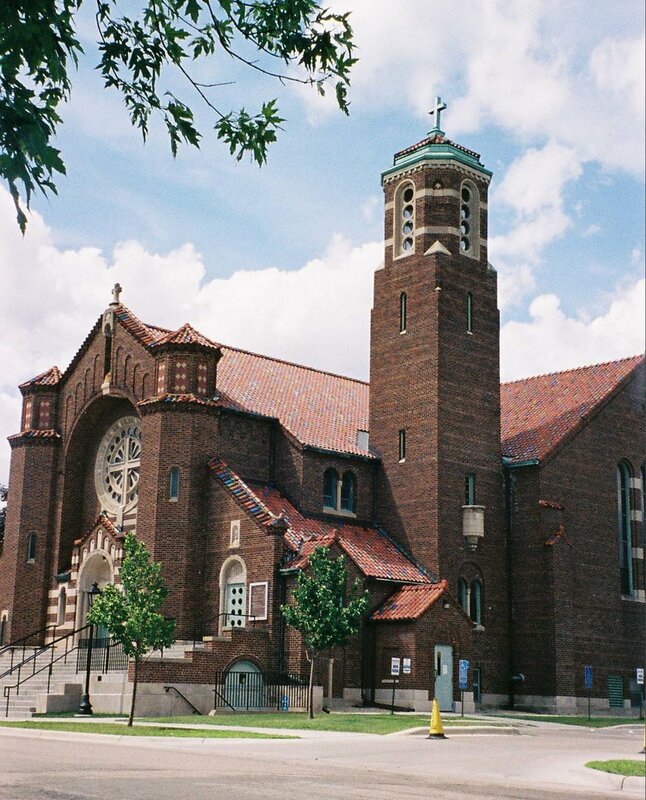 In addition to its architectural significance, St. Andrew’s Catholic Church is significant as an important institution within the Lake Como area that became a community center for the working-class congregation that it served. Since its founding, it has been a focal point for the community, having been used for dances, plays, festivals, organizational and club meetings, breakfasts, and all types of events. In short, it houses a great deal of our neighborhood’s identity and history. The church also served a community of Hungarian immigrants and is significant for its association with the Hungarian immigrant experience. 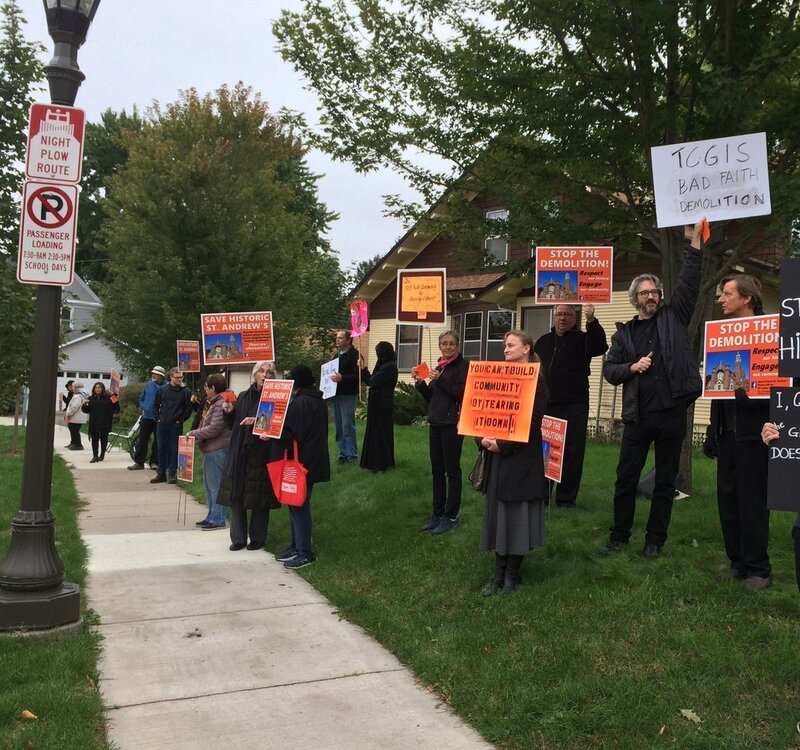 It should come as no surprise to see so many people up in arms about the proposed destruction of the church building. It is very much an active part of the community; a living history of this neighborhood. If you have photos of the St. Andrew’s church building that you would like to share with us, please contact us at savehistoricsaintandrews@gmail.com. St. Andrew’s Catholic Church was established in 1895 when four local residents petitioned the pastor of the Church of St. Vincent to create a mission church in order to serve the growing population of the Lake Como area. Even though the area that was to become the heart of St. Andrew’s parish had been platted in 1859 as “Como Villa,” growth had been very limited. But in 1883, the right of way for a subsidiary line of the Northern Pacific Railway between St. Paul and Brainerd was routed just to the south of Lake Como. More importantly, the directors of the Northern Pacific decided to construct extensive shops along the right of way. Construction of the eleven buildings that were to comprise the Como Shops was completed in 1885. As the shops became operational, employees sought housing nearby, and Como Villa and adjacent areas saw a rapid increase in population. The new mission church was housed in a building that had been constructed at the intersection of Hatch and Churchill streets in 1889 by a Presbyterian Congregation. After the Presbyterians vacated the building, it was purchased for St. Andrew’s and moved diagonally across the intersection. 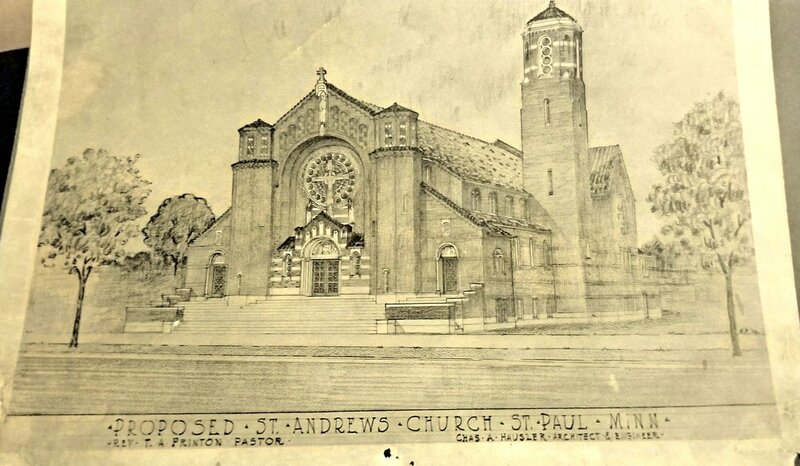 On April 6, 1907, St. Andrew’s was incorporated as an independent parish. Father George Arctander became the first pastor. The congregation continued to grow and in 1908 the church was enlarged with a thirty foot addition. As of that same year the congregation included 195 families and a total of 923 parishioners. Following the death of Father Arctander, Father Thomas Printon was appointed the second pastor of St. Andrew’s in 1910. Shortly after his arrival he made plans to improve the church building. In 1912, the church was raised and a basement hall was added for social functions. The front entrance to the church was also enlarged. But the congregation continued to grow and to help relieve the overcrowding, a new congregation, the Church of St. Columba, was established in 1914. St. Columba absorbed the southern portion of St. Andrew’s parish. It had become clear a new church building was needed, as well as a school. Fund raising efforts began and land was purchased at the intersection of Argyle, Chatsworth, and Van Slyke streets. In 1919, a combination church and school building was completed. The two-story building was constructed on a raised basement and measured 98 feet long and 70 feet wide. The building was clad with brick and stone trim and covered with a flat roof. The church was located on the basement level, six classrooms were on the first floor, and the school auditorium was on the second floor. However, the congregation had difficulty raising funds for the building and its cost was ultimately paid through a gift of $60,000 from Timothy Foley, a St. Paul businessman. Thus, the first decade of Father Printon’s pastorate began with a congregation of nearly 1,000 housed for worship in a church with a capacity of 300. It closed with a parish population of 1,458 in a larger church seating 850, but which was considered a temporary facility. It also closed with the prospect of over 200 pupils attending the first day of classes when St. Andrew’s school opened in the fall of 1920. 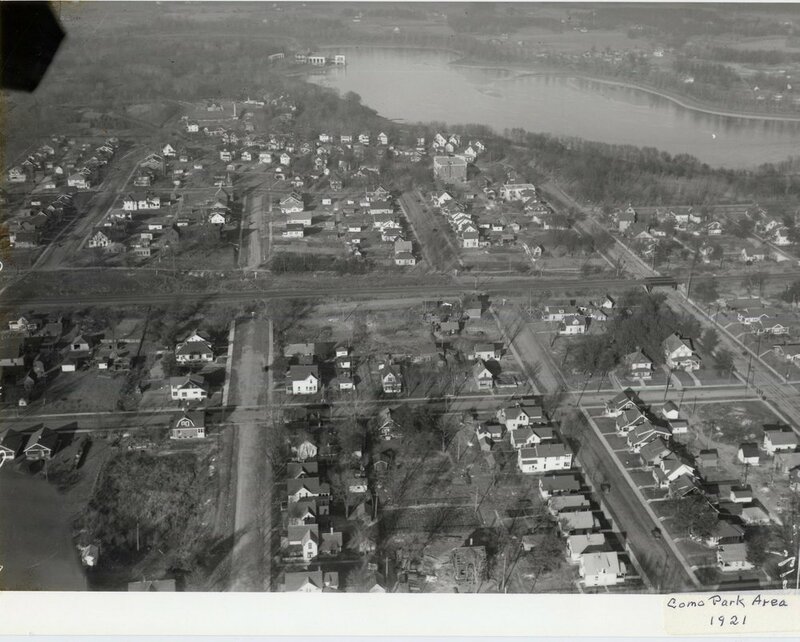 Between October 1923 and February 1926, more land was acquired for the parish that was located less than a block away from the combination church and school building. The land consisted of Lots 12-15, Block Four, of the Warrendale subdivision, on what is today Como Avenue. The first building erected on the property was a new convent in order to provide adequate living quarters for the nuns that staffed the school. 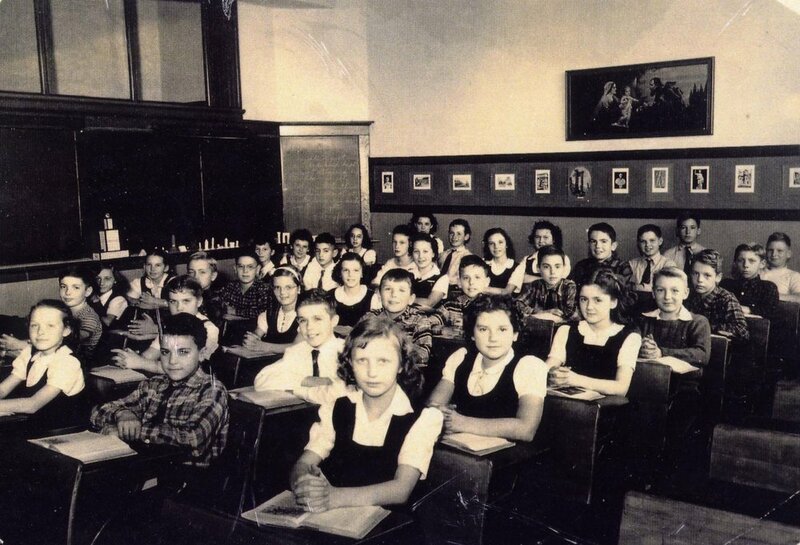 Whereas six nuns from the Sisters of Notre Dame were able to staff the school in 1920, enrollment doubled to about 450 students by 1925, and twelve more teachers were needed. A fundraising effort began and in 1926 a new convent designed by John Wheeler was constructed. On November 5, 1926, just four days after the nuns moved into the new convent, a building committee met with Father Printon to decide on the first steps to construct a new church that was designed by Charles Hausler. Construction proceeded at a rapid pace and the building was completed by the end of 1927. The church was built just to the west of the convent. The parish had become the social as well as the liturgical center for Andrew’s 500 families. Events held in 1927 confirm the diverse activities of the parish. They included a succession of card parties, club meetings, an all parish bazaar, dances, plays, lawn socials, festivals, and a traditional St. Patrick’s Day program celebrated by a two-hour stage program. The Great Depression also affected St. Andrew’s. The building program of the 1920s had left the church with $131,000 in debt. In 1937, the indebtedness had only been reduced to $111,500.00. The 1930s brought further changes to the congregation. On July 24, 1939, the Church of St. Rose of Lima was incorporated from the northern portion of St. Andrew’s parish. One hundred families from St. Andrew’s transferred to the new parish. But additional congregations would also be created from St. Andrew’s as the Lake Como area grew and expanded into the suburbs. Corpus Christi was established in 1940. 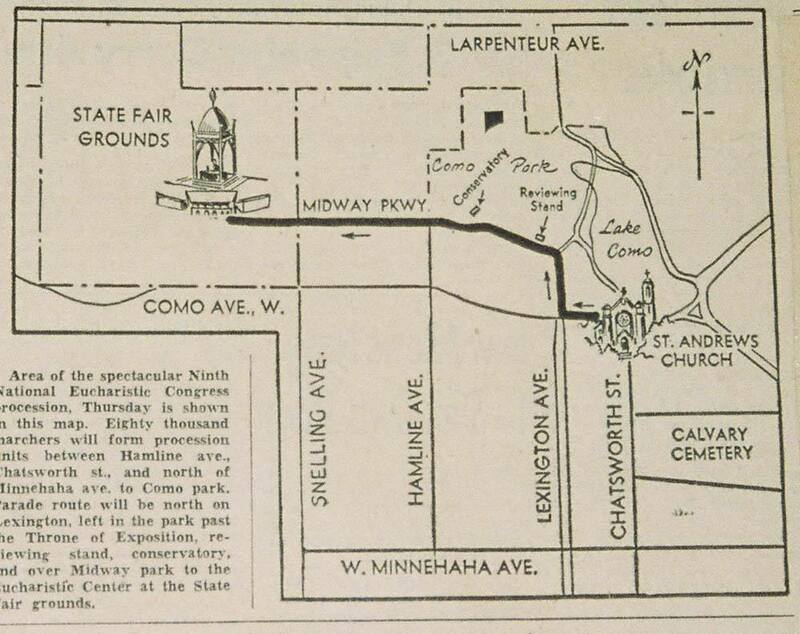 And then in March 1946, the Archdiocese created what became referred to as “The Great Divide” by designating the area west of Lexington to Snelling Avenues as a new parish to be called the Church of the Holy Childhood. 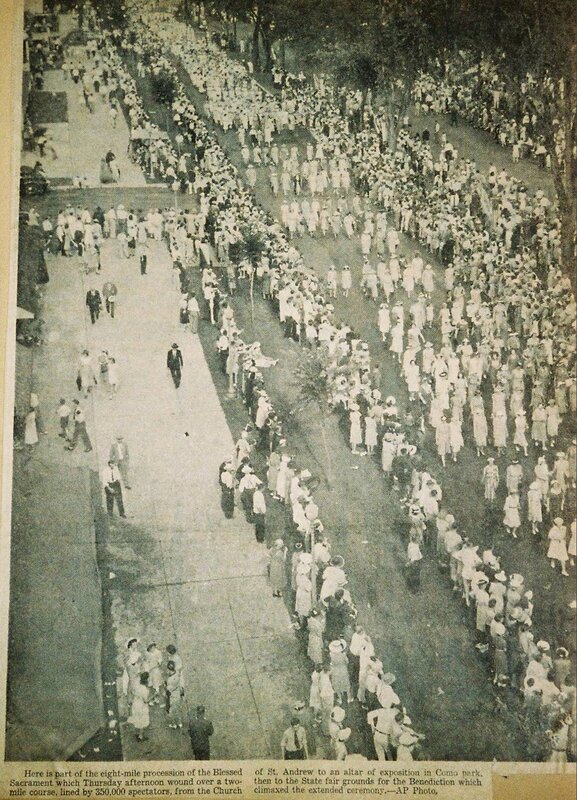 Then in 1949, Maternity of Mary was established to the east of St. Andrew’s. Four hundred twenty-five families alone transferred from St. Andrew’s to the Maternity of Mary and Holy Childhood. St. Andrew’s continued to thrive and the congregation constructed a new rectory just to the west of the church in 1950. The building was designed by Bettenburg, Townsend, and Stolte. In 1957, a new school was built just to the north of the church. The building cost approximately $300,000 and contained twelve classrooms, a lunchroom for hot lunches, a library, an auditorium, and offices. The school was designed by Shifflet, Backstrom, Hutchinson, and Dickey. The old church and school building was eventually demolished. 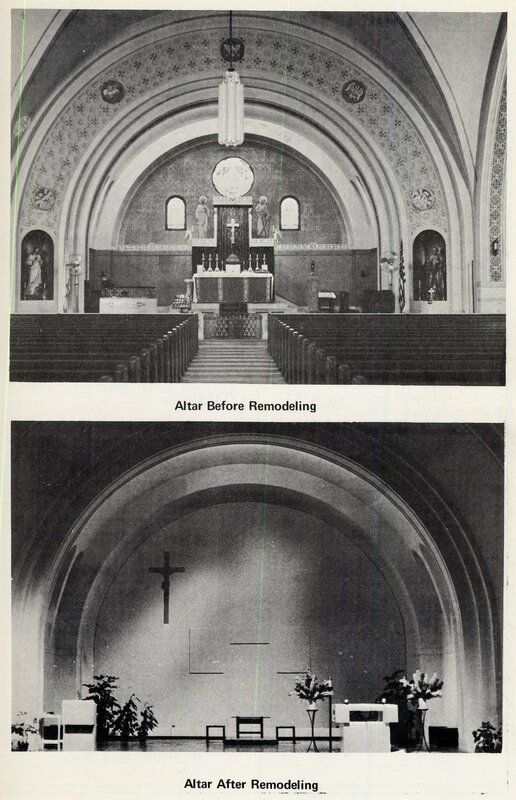 In 1968, as a result of the Second Vatican Council, the interior of the church was modernized and simplified. St. Andrew’s was one of the first churches in the Archdiocese to be updated. As part of the changes, the three stained-glass windows in the chancel were closed off, although one of the openings was later reopened. In 1989, St. Andrew’s school merged with the school at the Maternity of St. Mary. The merged school was called Maternity of Mary/St. Andrew’s – MMSA, and was located at the Maternity of Mary site. The school was still used for parish functions and continued to house a preschool program, but space was also leased to the St. Paul Public Schools for special programs.11 Space was later leased to a French language immersion program. St. Andrew’s celebrated its 100th anniversary in 1995. But in 2011, the congregations of St. Andrew’s and the Maternity of Mary merged, and functions transferred to the Maternity of Mary site at the intersection of Dale and Arlington. In 2013, the property was purchased by the Twin Cities German Immersion School.